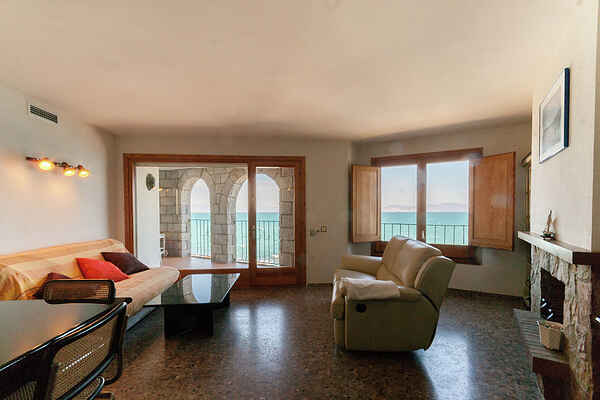 You will find this apartment in the old town of L'Escala, with a very central location, with magnificent views over the sea and few meters from the beach. It is an apartment on the second floor with elevator. It consists of three bedrooms, kitchen, living room with terrace, a toilet and a bathroom with bath, ideal for 6 people. Located in the Alt Emporda, where you will find sandy beaches and coves. In l'Escala find one of the villages of the Costa Brava more familar offset between tourism, young, active and cultural. Here you can enjoy all kinds of sports, children's and cultural activities. A must is to see the "ruïnes d'Empuries", which are at few kilometres. L'Escala maintains the type of fishing village that retains the charm of yesteryear, with its narrow streets that go down directly to the sea.